Finding discounted travel to Europe can be done with a little care and advanced planning. Europe is small, but it is packed with dozens of must-see attractions. With 40 different countries, 230 languages and 700,000,000 people, Europe can appear daunting to explore, but it is quite manageable if you plan in advance. Europe is a traveler's paradise, as it combines Old World charm with modern flair. You can spend a lot of money traveling to Europe, but if you are a well-informed shopper, it is possible to travel on a modest budget. Traveling by sea offers the budget conscious an economical way to experience romance and adventure with leisurely days at sea. An ocean voyage can bring to mind pricing reminiscent of classic luxury liners, but there are modest alternatives available. These include last-minute cruise deals with mainstream cruise lines offering European discount cruises. Choose an inside cabin to save even more. Another option is to book tickets aboard commercial vessels, specialty cruises and cargo voyages, which offer an exciting sea alternative for adventurous spirits. Discount air travel to Europe appeals to flexible travelers looking for the cheapest fares. Often, purchasing advanced tickets will save you money, other times you can save more with last-minute deals. The most effective way to save money is to keep an eye on fare prices on travel websites. A thick network of railways and highways crisscross the ancient landscapes of Europe. This makes traveling from one place to the next an exciting trip in and of itself. With a little flexibility and some resourcefulness traveling through Europe on a budget is a breeze. Flying is the fastest and cheapest way to travel Europe. Several discount airlines operate within the continent and can fly you for pennies across many countries.Three of the cheapest and most customer-friendly airlines within Europe are Aerlingus, RyanAir and EasyJet. You can often get amazing discounts by searching their sites on a regular basis. In general, Tuesdays and Thursdays are the cheapest days to fly. For better discounts, search different departure dates well in advance of your trip. If you're flexible with your departure date and time, you can often find intercontinental flights for under 10 euro. Be sure to arrange transportation to and from the airports you fly into, as discount carriers sometimes land in smaller airports. If you want to travel Europe at your own speed, there are a number of car rental companies available. However, be warned that roads in Europe are a very different than in North America. Streets are smaller, drivers are more aggressive, and gas prices hover around $7 per gallon. 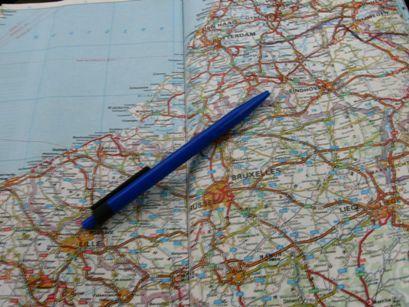 Renting a car isn't the cheapest way to explore Europe. To gauge car rental prices, check out the AutoEurope website. Expect to pay around $40 per day in most countries, not including gas. Also, be sure to have an international driver's license and get it before you leave. Buses are great for moving back and forth between towns within any European country. They're often a necessity when flying into smaller airports outside of the main part of the city. Bus fares are generally cheap, only a few euro, and you can usually buy a ticket from the driver. Find a good bus schedule and you can travel to many towns in a surprisingly short amount of time. Buses usually run within small loops between cities. However, some tour buses can take you across towns and into new parts of the country, but they're generally more expensive. Devise a travel budget before taking a European holiday so you know exactly how much you have to spend on transportation. The more flexibile you are with time, the better chance you have of securing deeply discounted fares. Also, consider traveling off-season so that you can score reduced prices on car rental and airfare.